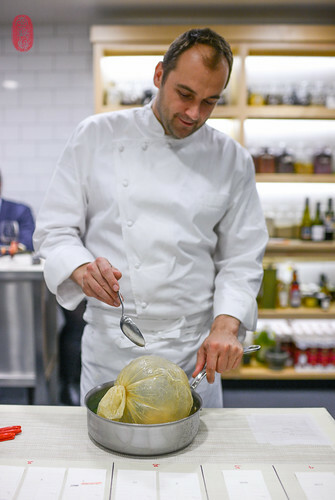 There are few restaurants about which I have been more enthusiastic than Eleven Madison Park in the first couple of years that Daniel Humm became head chef there. If you look back on this blog, you’ll find many posts cheering him and his team in those transformative days of dining in New York City. While restaurants and critics began shrugging off the linens and white coats of formality, Humm began donning layers of luxury, defying the trend and demonstrating that fine dining could both be refined and fun. And I loved it. In subsequent years, I have been a faithful visitor. I have eaten at Eleven Madison Park at least once every year since Humm arrived. And just when I thought this would be the first year I’d go without an Eleven Madison Park show, Daniel Humm appeared at the eleventh hour. Together with Christopher Kostow, who worked under Humm at Campton Place in San Francisco, he, the Swiss chef who built an empire on the corner of Madison Square Park, cooked the first dinner of this year’s Twelve Days of Christmas at Meadowood Napa Valley. For the fourth year, I’m the lucky guy who gets to photograph and eat all twelve dinners at this year’s event. And I’ll be reporting about them here over the next two weeks. In his address to the staff at line-up, Humm said that he had arrived at a place in his career where he has begun to think in simpler terms. He marveled, for example, at the intensity, and yet simplicity of Joan Miró’s art (I have long been an admirer of Miró’s work and style, and even wrote about the references to his art that I noticed in the cooking of another, great Swiss chef). While Humm’s cooking has always been relatively clean and simple, I did notice a particular type of simplicity in the dishes he chose to present at the Twelve Days of Christmas. He reduced, for example, a piece of celery root to an orb, served with little more than a drizzle of meat jus with black truffle, and a pool of black truffle purée, capped with a frothy celery root purée. 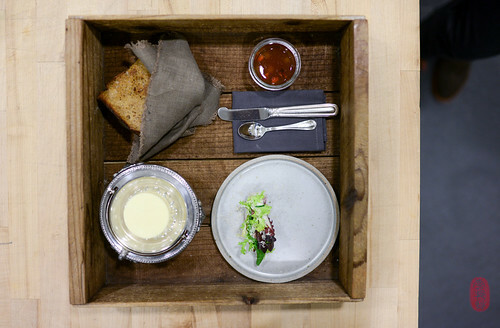 This monochromatic and geometric presentation was almost presaged in the famous “black and white” cookie, which has been a fixture on the Eleven Madison Park menu for quite some time, and which awaited diners as they were seated at The Restaurant at Meadowood; a pre-meal snack. I will never forget the “Elevages de Perigord” torchon au foie gras I had at my first meal at Eleven Madison Park in 2007, marbled with veins of cocoa. And I will not forget the stunning foie gras layered in red cabbage that Humm presented at this dinner. 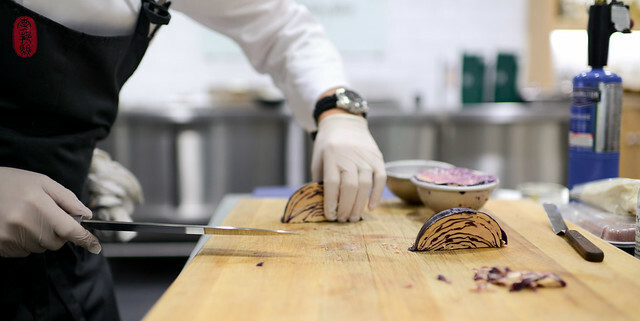 Like the celery root dish, this too was meted out in simple, circular terms: a crescent of foie gras threaded with dark purple; and to the side, a disc of magenta. It was beautiful, and delicious. Three-hundred and sixty degrees was the theme of another dish – chopped raw scallop laced with caviar and topped with a seared slice of scallop and a quivering spoonful of translucent apple gelée. Christopher Kostow was been working with whelks for some time now. I’ve had a few version of whelk dishes at The Restaurant at Meadowood, but the one Kostow served on this first night of the Twelve Days of Christmas has been my favorite one so far. He made a velvety mousseline of whelks and stuffed it inside of an onion, which was melted until soft. This gorgeous, silky torpedo was garnished with bright, floppy nasturtium flowers, and finished with a warm broth of whelks. At course six arrived the rich, musty smell of dry-aged beef – a slice of tender bavette topped with a seared slice of porcini, and finished with a luxurious sauce of foie gras. Unlike in previous years, where a specific Napa Valley vintner and their wines were paired with each guest chef at the Twelve Days of Christmas, this year, the wine team at The Restaurant at Meaodowod is working with Kostow and the guest chefs to tailor the wine pairings to each meal and each course. 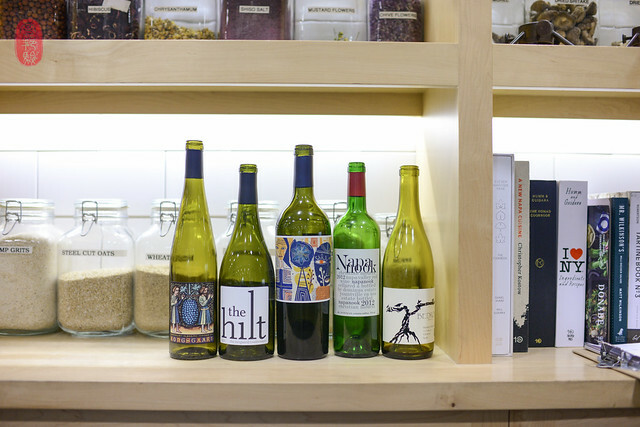 So, over the next two weeks, we will see a wide range of California wines. Below, you’ll find the menu from the first night of the Twelve Days of Christmas featuring Daniel Humm. To see all of the photos from this dinner, CLICK HERE. Cooked en vessie, with black truffle. 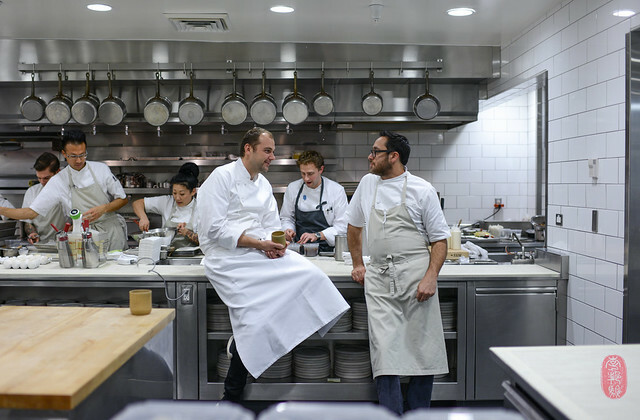 Photos: Daniel Humm’s foie gras in cabbage; Daniel Humm and Christopher Kostow in the kitchen before service; Kostow’s Brillat “Butter,” Daniel Humm basting a pig bladder in which he cooked celery root; the wines paired with this dinner. ~ by ulterior epicure on December 7, 2015.